Jane's Addiction has written the rule book for alternative music and culture through a combination of genre-defying classic songs and a cinematic live experience. Their songs serve as the Ten Commandments for alternative rock, inspiring an entire generation of bands such as Nirvana, Rage Against the Machine, Nine Inch Nails, Smashing Pumpkins, Pearl Jam and Tool. Perry Farrell stands out as one of music's most forward-thinking and enigmatic frontmen, and his vocals soar with vibrancy, vulnerability and vitality. Guitar god Dave Navarro conjures simultaneously psychedelic and epic riffs while Stephen Perkins' tribal stomp remains hypnotic and transfixing. In 2010, Jane's Addiction began writing songs for the new album. By 2011, recording began on what would become The Great Escape Artist, an October 2011 release on Capitol, to be supported with a worldwide tour in 2012. The band and producer Rich Costey (Muse, Franz Ferdinand, Interpol) added TV on the Radio's Dave Sitek to the creative team. Sitek, best known for his production work on TV on the Radio, Yeah Yeah Yeahs and the Foals, is writing and playing bass on the new album. The Boulevard Pool sets the stage for Las Vegas’ most unique live concerts. 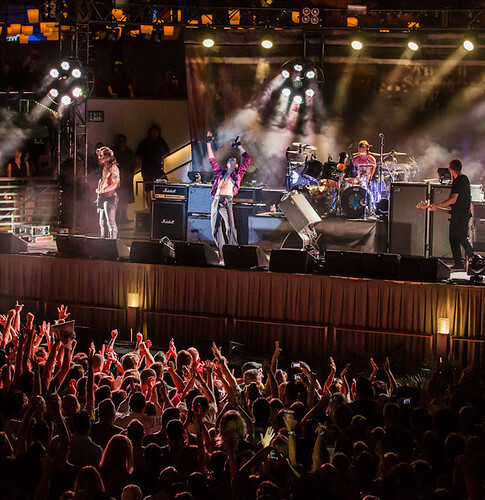 Perched high above The Las Vegas Strip, The Boulevard Pool is a multilevel pool experience by day and an intimate outdoor concert venue with unobstructed sightlines of both the stage and The Strip by night.